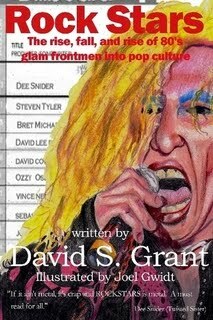 If you miss the 80s half as much as I do, then you must read David S. Grant’s Rock Stars: The Rise, Fall, and Rise of 80s Glam Frontmen Into Pop Culture. This was a no-brainer for me. After all, the CD that gets the heaviest play in my car is Guns N Roses Appetite for Destruction. The ring tone on my cell phone? Sweet Child O Mine. (Also GNR, for the less â€˜80s-obsessed.) Starting to get the picture? And, as a teenager, my bedroom walls were covered with pages ripped from magazines. Don’t judge me. That being said, I tore into Rock Stars like a giddy teenager. And I was not disappointed. But you have to know what to expect. This is not a doctoral thesis. It’s not complicated. It is a self-indulgent book that is written in a conversational tone, which can be great, depending on the material. In this instance, as Bret Michaels would say, it’s awesome. My only issue with this book — here it comes — is the editing. It has quite the number of misspellings (sighted vs. cited, sites vs. sights, here vs. hear and so on), punctuation errors, and the like (Kickstart My Hear, Look What the Cat Dragged tsk, tsk), but it doesn’t really matter. However, given the topic, I found it unforgivable that Grant wrote Def Lepard (repeatedly!) and Led Zepplen. In fact, it was pretty disturbing to see in print. I don’t know that Led Zeppelin has ever been misspelled in the history of rock n roll. Rock Stars is, in its current state, crude. It’s somewhat choppy, not very uniform in its format, and has no page numbers. No, I’m serious. But don’t misunderstand me. The book reads almost like a journal, often with the stream of consciousness technique (especially when Grant is critiquing heavy metal videos, which I found thoroughly enjoyable). Grant has a great sense of humor, a keen eye and wit for dissecting the topic, and his breadth of knowledge of this genre is obvious. I read Rock Stars in one sitting and was disappointed when it ended. If you’re the type who blasts your stereo when you hear the opening notes of Wanted Dead or Alive or Pour Some Sugar on Me, this book is for you. Grant characterizes it as Behind the Music on cocaine. Bingo. Thanks for the great review of David's book. I really enjoyed this one too. Sure made me want to pull out my Crue CDs and rock. I have got to get a copy of this book! I know in my mullet's mind I already love it!